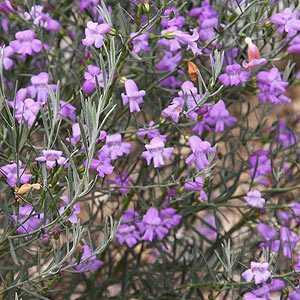 A small spreading shrub Eremophila drummondii x nivea is grown for the masses of mauve flowers from spring to summer. It will spread to around 1m with a similar height it is a plant that requires a frost protection when first planted and excellent drainage. So a raised garden bed suits well. Full sun and good mulching to retain some moisture and a cool root run. We suggest preparing the soil well before planting, ensure drainage is good and either amend the soil, or raise the planting area in poorly drained soils. Young plants will need protection from frosts and rabbits, so use a plant guard if these are problems. Water in well and apply some additional water through the first summer during any long dry spells. Foliage – Evergreen, mid to deep green in colour. Drought tolerance – Medium once established. Frost tolerance – Medium, tender when young.